His unique images, a harmonious fusion of light and colour, are in constant demand by leading international publications such as Life, National Geographic, GEO, Newsweek, The Telegraph and The Sunday Times. Jeremy is a veteran of over 20 assignments for UNICEF, on all continents, from Nicaragua to North Korea. He spent six years exploring Latin America and published four books: Living Incas, The Life of Colombia and Fiestas - Celebrations and Rituals of Colombia as well as a book of aerial photographs of Colombia. He has produced books on Brunei and Saudi Arabia by royal commission and participated in prestigious international projects of the world's leading photographers. Jeremy also wrote his most recent book, Island Dreams Mediterranean, published by Thames and Hudson. His corporate clients include BP, Bloomberg, Orient-Express and the UAE government. 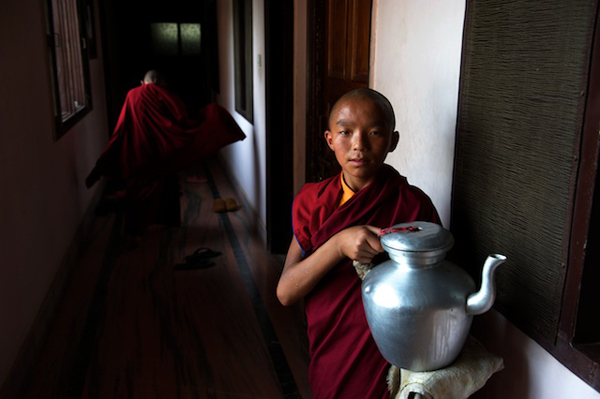 Jeremy's experience as an assignment photographer around the world is invaluable. Even with limited budgets and with severe time constraints he is uncompromising in the pursuit of superlative images. He continues to work on subjects he is passionate about, such as the Himalaya and living Buddhism. Jeremy Horner's archive of over 50,000 edited images can be sampled here at Photoshelter. He also has image collections with Corbis and Getty and has been a member of Panos Pictures since 1995. When not on assignment he divides his time between England and Bangkok. This entry was posted on Wednesday, April 11th, 2018 at 8:59 am. It is filed under Blog, Travel and tagged with Jeremy Horner. You can follow any responses to this entry through the RSS 2.0 feed.